From Jellygnite, here is Ali's swap book. 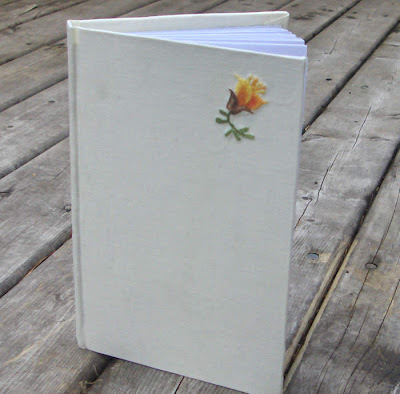 A pretty hardcover book, case bound in full cloth, with a little embroidered flower in the corner. 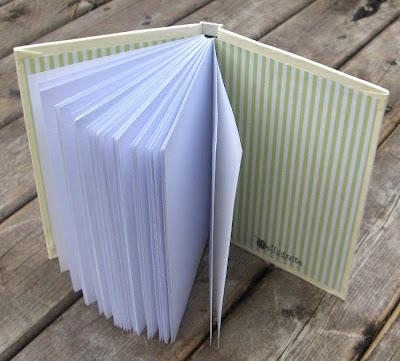 This small sketchbook has 40 sheets of crisp, white, 180gsm drawing paper and pretty green striped endpapers with Ali's signature stamps inside the front and back covers. Visit Jellygnite.Etsy.com to see more of Ali's creations. See all the books from Book Swap #5. This lovely book is mine now! Ali, I have been meaning to ask if you embroidered that little flower on there yourself? Rhonda, so glad you got it! The fabric cover began life as a cloth serviette/napkin. I found four of them at a thrift shop and fell in love with the little flower! What a great idea, Ali! And a lovely book too!